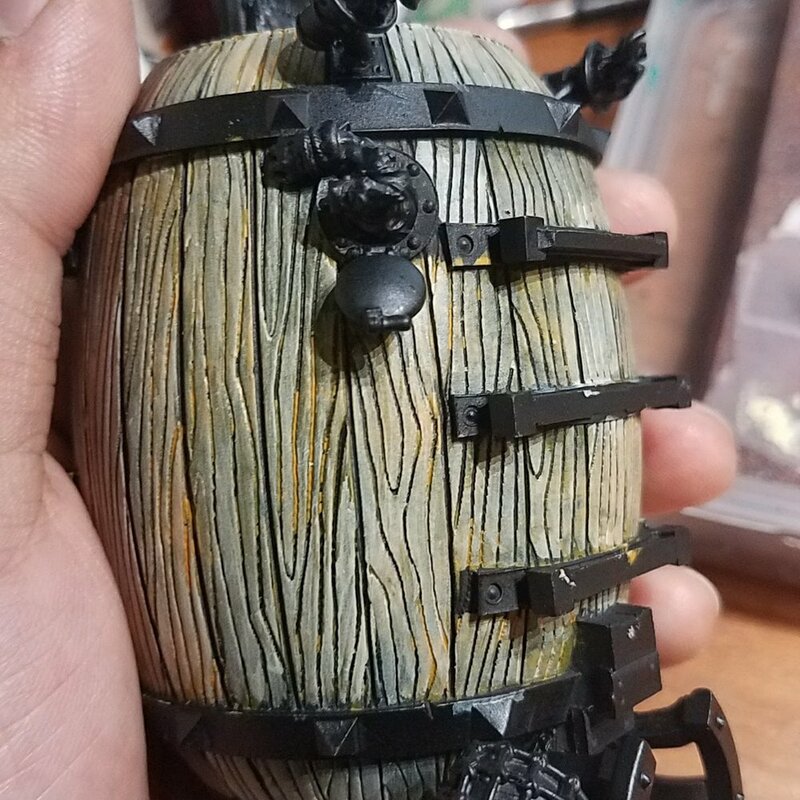 One of the projects I've been working on for the last little while is the monstrous Hearthgut Hooch Hauler. Which is so big and complicated that I've got it in 13 different sub assemblies to paint. 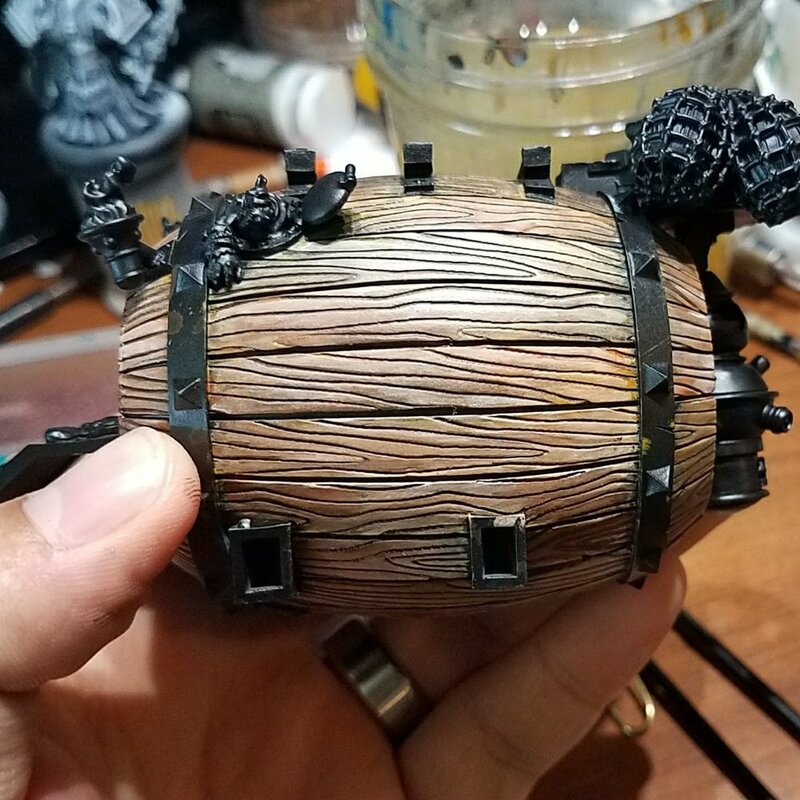 I've been working on the barrel of late, and I've gotten quite a few requests for a tutorial on how I got this particular look for the wood planks on it, so naturally I am happy to oblige. This is a pretty standard basecoat over a black primer. You're going to do two thin layers of this color, letting each layer dry completely before moving on. Don't worry if it's still a little blotchy at the end of this step, you're putting a yellow over black which is always hard, and you're going to cover it up with layers of other colors as well. Also, wood isn't uniform in color throughout the grain, so that's just fine! This step hits all of the raised areas with a couple thin coats of Menoth White Base. Try and keep this color out of any sculpted cracks if you are doing it on a sculpted surface or else you'll have to do a fair amount of work in order to make it look correct. If you're doing this on a flat surface, it's even more important to keep the highlight lines distinct from the base coat. This is where we tie everything together. Washes are used to darken in lines and to blend out the transitions between colors. 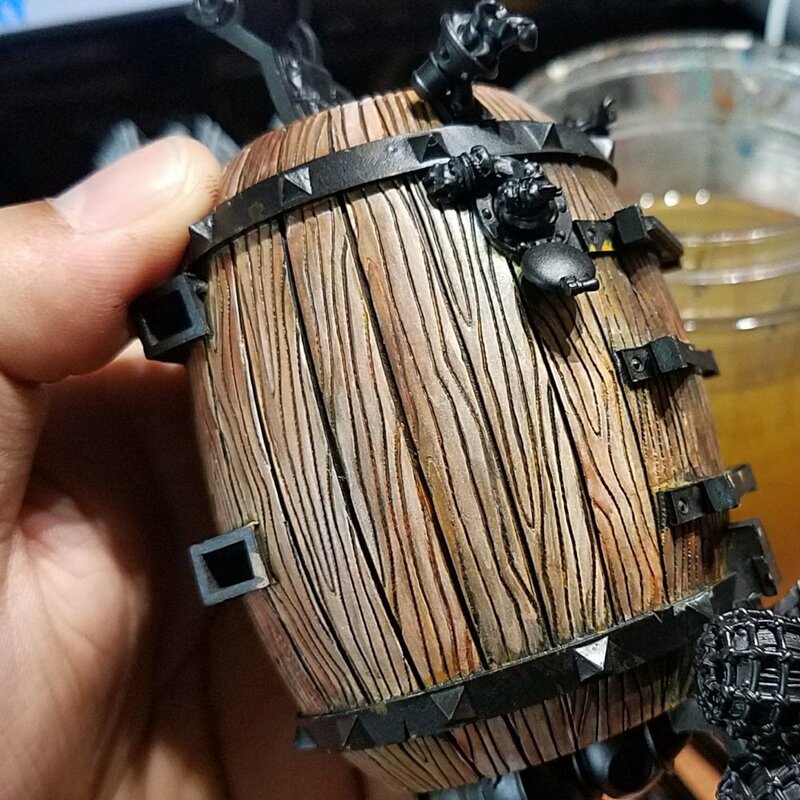 On a sculpted wooden surface, you're going to generously apply the wash all over if you want to make the boards darker, and a more conservative wash if you want them to be lighter. When you're doing this free hand, it requires a bit of a different approach. You first need to carefully put some thin lines of dark wash down that doesn't cover any of the light areas. Let this dry, and then apply another wash similar to the sculpted wood. We're doing it again! Thin this highlight down a bit, and blend it into the lighter parts with layers and some two brush blending. This won't be quite as stark a contrast as last time, but it makes an important foundation for the next highlight. Mix a little bit of Pure White into the Menoth White (something like 4:1 Menoth White to White) and just hit the edges of some of the lighter lines with it. Don't overdo this layer or it will look very, very odd. This step is probably the most nerve wracking, but for the sculpted wood grain at least, it's pretty easy if you thin your paint down. This is taking a dark mixture and lining the darkest part of the boards. If the board is sculpted and you go over the indent, you can wipe the extra paint away with your finger before it dries with little or no stain. On a freehand, it's a lot harder and requires a very steady hand and a sharp point on your brush. There you are, a very nice tool in your hobby arsenal, and a great way to add some realism to your wood projects. This basic technique can be replicated with lots of different base colors and highlight colors, and is a pretty quick and painless way to do it. If you guys give this a try, I'd love to see pictures of what you come up with! It's always cool to see the crazy things people make. As always, thanks for reading. 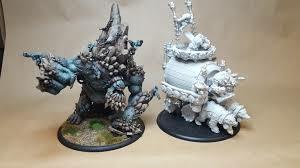 Stay tuned for more hobby content coming down the pipe, check out our Patreon if you'd like to support this kind of stuff, and I'll see you next time!